Kristen Manchette is a senior from Charlotte, NC, studying materials science and engineering. 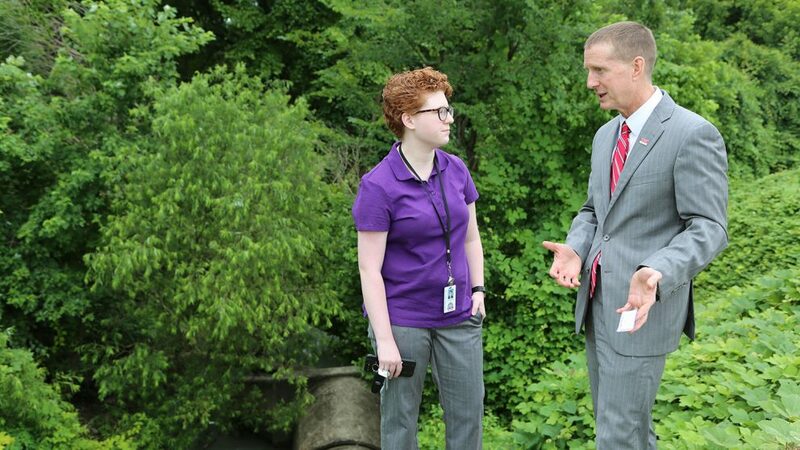 This summer, though, she learned the ins and outs of storm water best management practices. Manchette was placed in a summer engineering internship with the city of Kinston, NC, Public Services Department through Rural Works!, an NC State program that matches talented students with internship opportunities across North Carolina. Her first duty upon arrival in the county seat of Lenoir County in eastern North Carolina? Taking a look at a storm pipe pulling runoff from 133 acres of impervious drainage area in downtown Kinston and putting it into the Neuse River. The city identified a problem with trash and oil being carried with the storm water into the Neuse and asked Manchette to work on it. “It’s not doing its job, so we’re going to fix it,” she said while showing off the design she created using AutoCAD design software in her office. Manchette designed a pair of walls that storm water will have to pass over and then under, catching trash and debris, and separating oils, as it goes. As the summer went on, she designed an access road that will allow city workers to clean out the trap and worked on the construction and environmental permits that will be needed to kick the project off. Created by a partnership between the Division of Academic and Student Affairs, the Office of Outreach and Engagement and NC State Cooperative Extension, Rural Works! supports NC State’s commitment to social, economic and technological development across North Carolina by offering an engaging internship experience for high-caliber students in rural Tier 1 counties — areas identified by the state as needing assistance to reach their full economic potential. The program also requires students to participate in local service programs — to learn about local needs and challenges. John Siddiqui, a junior from northern Wake County, NC, who is studying both mechanical engineering and foreign languages and literature as a Benjamin Franklin Scholar, spent the summer getting to know every nook and cranny of Kinston. One of Siddiqui’s jobs with the city is to help identify Kinston’s roughly 12,000 electric meters. The information will be entered into a digital mapping program that will give Kinston officials a better way to track and prevent outages and other problems, and allow the city to move to smart-meter technologies. In its first year, the College of Engineering placed four students through the program — two with the city of Kinston and two with Timberline, a packaging and materials handling company in Vance County. The College provides participating students with a stipend from the Engineering Enhancement Fee, which is used to add and enhance educational opportunities. “There is a real commitment on the University’s part to Tier 1 counties,” said Dr. Jerome Lavelle, associate dean of academic affairs in the College. Fall/Winter 2018, materials science and engineering, mechanical and aerospace engineering, Rural Works!